Etawah is one of the most happening places in the district, flourishig rapidly into a major cosmopolitan and industrial area in the state of Uttar Pradesh. Yet it still holds its vibrancy and zeal in celebrating the different events that mark the lives of the people here. As such it remains the home to various businesses that offer from an extensive range services related to event management for all types of occasions having the ability to accommodate and serve small gatherings as well as big get-togethers. These event management companies in Etawah are chiefly the flower decorators, event organizers and banquet hall owners of the city proficient enough to cater to all the needs of the citizens here. 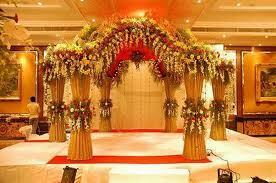 There are some event companies which also serve in Etawah. The flower decorators in Etawah specialize in decorating chattars, cars, stages, banquet halls, hotels and restaurants with dry flowers for weddings, functions and other important ceremonies. The AC banquet halls in Etawah are spacious enough to accommodate extensive number of guests for ceremonial purposes like birthday parties, engagements and weddings. The decorators and event management companies in Etawah provide exclusive services decoration of mandaps, stages and parties. These event management companies also lend out audio-visual equipments like the DJ equipments on hire.